Total time: Plan on 2 hours your first time. Adapted from Real Vegetarian Thai by Nancie McDermott. In a large bowl, mix together potatoes, cracker crumbs, onions, cilantro, egg and seasonings. 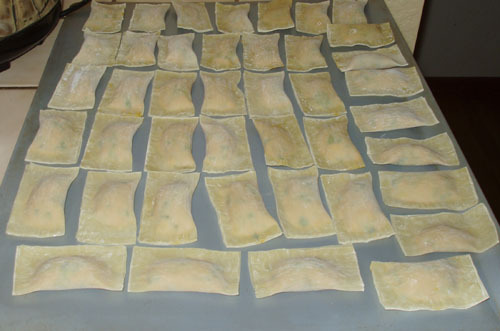 Place two teaspoons to one tablespoon of filling in the center of each wrapper and fold the dough in half, pleating the edges along one side. Heat 1-2 Tbsp of vegetable oil in a large frying pan (preferably one with a snug-fitting lid) on medium-high heat. 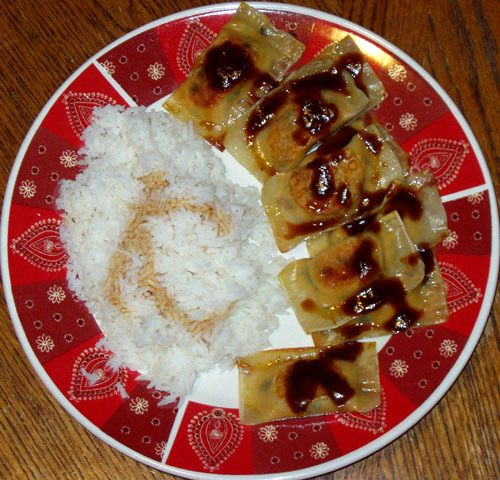 Arrange as many pot stickers as you can in the frying pan, and fry until bottoms are golden (2-3 minutes). Add 1/4 cup vegetable stock and cover quickly and tightly. Cook until the water has boiled itself away (about 3 minutes). Repeat for remaining pot stickers. I can fit 11-12 dumplings in my frying pan, if I’m using wonton wrappers. This exact recipe made 42 dumplings for me. Daring Cooks can reference the pot sticker challenge from June 2009 for more information on homemade gyoza dough, details on pleating and alternative cooking instructions. Total time: Less than 5 minutes. Mix well, warm or room temperature. I didn’t really measure any of this, I just kind of dumped in and flavored it to taste to match the curried pot stickers. 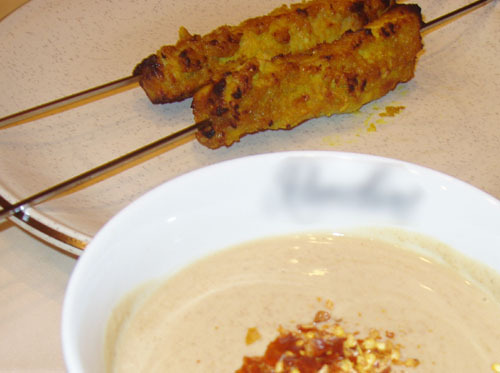 The January 2010 DC challenge was hosted by me, and I chose a delicious Thai-inspired recipe for Pork Satay with Peanut Sauce from the book 1000 Recipes by Martha Day. I picked this recipe for the DC challenge because it’s what I was cooking some 8 hours after offering to be the last-minute host, three days before the challenge was to be posted. 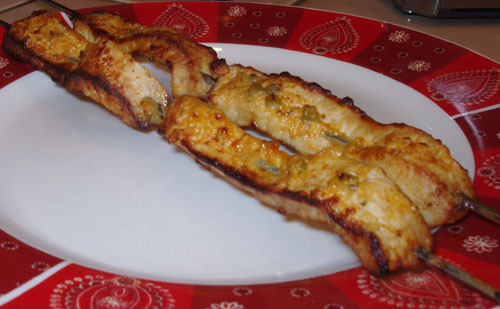 The focus of this challenge is to marinade. Total time: 40 minutes, plus marinade time. 1. Cheater alert: If you have a food processor or blender, dump in everything except the pork and blend until smooth. Lacking a food processor, I prefer to chop my onions, garlic, ginger and peppers really fine then mix it all together in a medium to large bowl. 2. Cut pork into 1 inch strips. 3. Cover pork with marinade. You can place the pork into a bowl, cover/seal and chill, or place the whole lot of it into a ziplock bag, seal and chill. 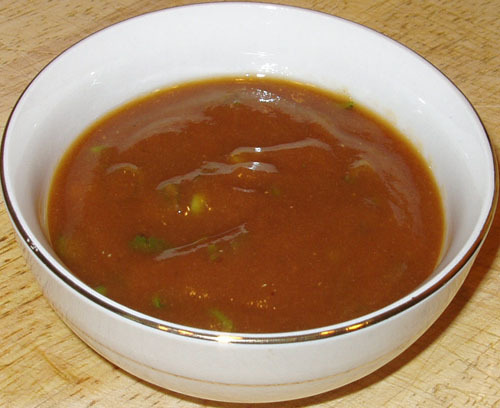 Shown above with peanut sauce. 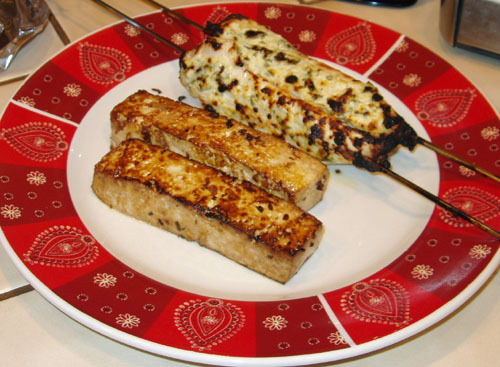 I also did this challenge using my trusty Pork Satay II marinade on tofu, pan fried (middle picture), chicken satay marinated in raita (shown with tofu), and the experimental but oh-so-wonderful TexMex Pork Satay marinated in a Chevy’s inspired chipotle and jalapeno cream sauce. 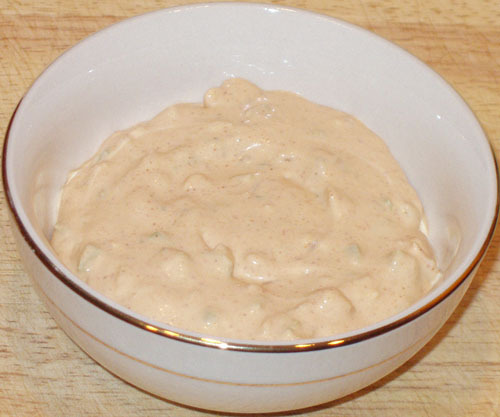 I also did all three dipping sauces suggested in the challenge (peanut sauce, Thai pepper dip, tamarind dip, with changes), as well as using the TexMex dip and my favorite raita. 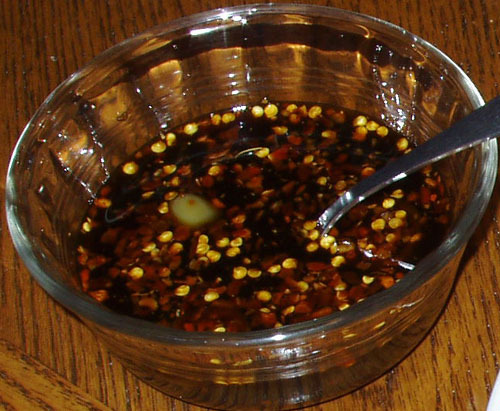 Substitute fish sauce for soy sauce and Thai dragon (bird’s eye) chili for the dried red chili.